We don’t know if in the movie, Effie Trinket will give President Coin a haircut, but let’s assume she will. There was nothing said in the book. 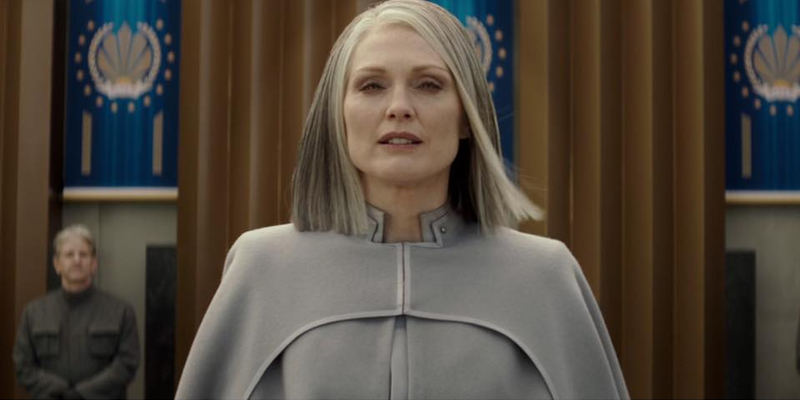 I’ve noticed in the Mockingjay Part 2 trailer (or the Hunger Games movies) that there were parts, scenes, characters, characteristics, subjects, and objects that weren’t really in the book at all. In Catching Fire, Mockingjay Part 1, and the trailer for Mockingjay Part 2, director Francis Lawrence added something new to the table, or maybe he even fixed the table himself. 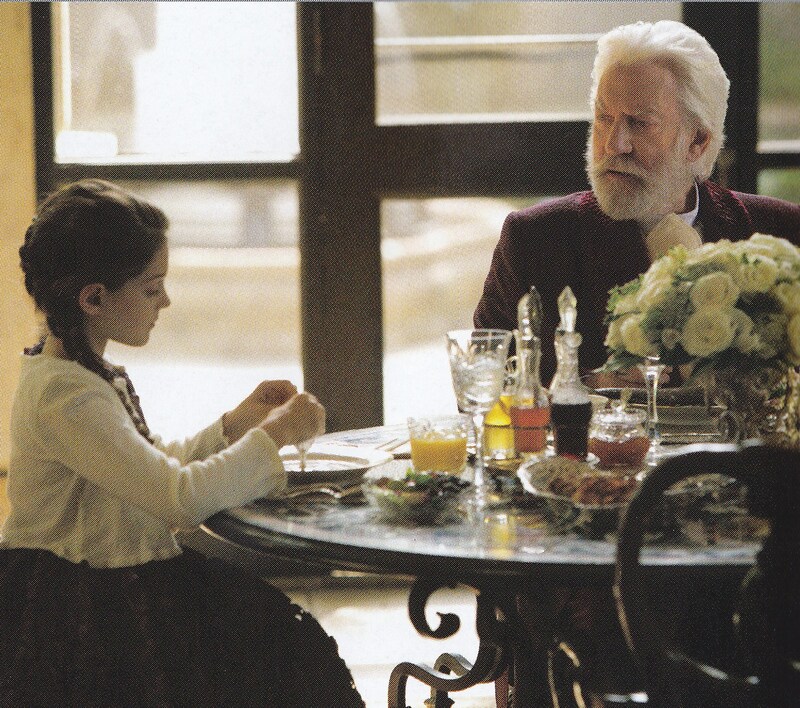 President Coriolanus Snow (Donald Sutherland) with his granddaughter (Erika Bierman) talking about how everyone now at school wears her hair like Katniss’. Things like that are not just random thoughts. What Lawrence wants to imply by a simple haircut is that President Coin is preparing for something big, and I’m not telling you what it is, if you haven’t read the books already. Lawrence gives us the eyes that Katniss Everdeen doesn’t have. Remember that the whole trilogy was in Katniss’ own point-of-view, so if she’s in District 12, she can only tell you what she sees and feels in District 12, if she’s in the Capitol, then she would tell you the things that are happening in the Capitol while she’s there. The trilogy is not like Harry Potter, in which the story is by a third person who witnessed the events that happened. Francis Lawrence also has a creative take on the characters. In the trailer for Mockingjay Part 2, you see Tigris looking beautiful. I don’t know, but I imagined her face a bit more distorted and weird while reading the book. And look at the mutts, goddamn it! All I’m saying is that Francis Lawrence is one hell of a director that combines creativity and logic in making these films. I’m looking forward to Mockingjay Part 2, because I know that this movie is not just about the second half of the book, it’s also about the whole revolution itself, how people of Panem rise from the ashes and turn their weapons against Snow, and the things Katniss Everdeen are clueless about or not witnessing. If you haven’t read the books, then you don’t need or have to if you’re going to see the film. Francis already got you covered up. Also, I’d like to point out that Francis Lawrence follows a saying in filmmaking: “Don’t tell me; show me.” The words between the lines in the book, he doesn’t put it into a conversation between Katniss and Gale, he shows it on the screen instead. Even for Gary Ross, the director of the very first movie. And lastly, if this movie doesn’t show up in the Oscar nominations next year, even for Best Visual Effects, I would be really pissed off. Come on, Academy, this isn’t a teenage-love-happy-ever-after-heart-pounding-fist-fighting series anymore like Divergent that you don’t like! This is a war movie with many meanings and action, visual effects and actors that are part of your inner circle and are really really good (Julianne Moore, Philip Seymour Hoffman, Jennifer Lawrence, Woody Harrelson, Donald Sutherland)!